Designed to offer non-musical theatre in an intimate space, the PalParks Black Box program will present Christopher Durang’s Beyond Therapy on May 18, 19, 25, 26, and 27. All performances will begin at 7:00pm at the Palatine Park District Community Center, 250 E. Wood Street in Palatine. Tickets are $10 each and can be purchased in advance online or at the door beginning one hour before show time. The play by Christopher Durang centers around Bruce and Prudence who are deeply into therapy. Prudence’s macho therapist is urging her to be more assertive while Bruce’s wacky female therapist wants him to meet women by placing a personal ad. She does not fully comprehend that Bruce has a male lover who is not pleased by Bruce’s desire to date Prudence. Bruce doesn’t know how to handle poor nervous Prudence and Prudence doesn’t know what to make of her unpredictable new boyfriend. “Modern life has led us all into constant miscommunication and diversion,” said director Kristen Foley. “I love how Christopher Durang is able to stick our situation in our face and forces us to laugh.” The Community Center music room is transformed into a black box theatre space for two weekends to create an intimate performance space for approximately 50 audience members per performance. According to Foley, “Performances in spaces like this helps you better understand what the character is thinking and feeling and making you apart of the action. 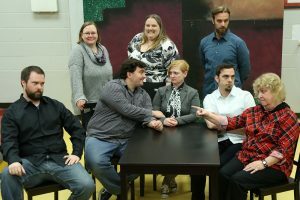 It’s like you’re sitting at a table with these characters experiencing the laugh out loud they have to one another.” Cast includes Christopher Pantelis as Bruce, Teresa J. Arnold as Prudence, Michael Noens as Stuart, Linda Sak as Charlotte, Andrew Namowicz as Bob, and Matt Sirotzki as Andrew. Beyond Therapy is not recommended for those under the age of 18 due to mature language and content. For more information on PalParks Black Box, contact Cultural Arts Coordinator Ashley Schiavone at aschiavone@palatineparks.org or 847.496.6237.